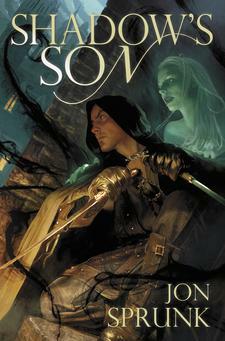 Jon Sprunk is the author of the Fantasy debut Shadow's Son from Pyr Books, which I just recently reviewed. Sprunk only has a few short story credits to his name so little was known about him, which is why I had to corner him. This is the first interview I have ever conducted without first reading one of the author's books prior so in some ways it was a challenge for me, but I think it accomplishes what I set out to do. MH: What first drew you to Fantasy and Science Fiction? SPRUNK: I read a great deal as a child (and still do), but SFF stories always held a special magic for me. They possessed a sense of wonder that more mundane adventures couldn't match. In the end, I suppose its a matter of taste and predilection. I believe the first fantasy novel I read was a little tale called Kothar and the Wizard-Slayer by Gardner Fox. From there I discovered Robert E. Howard's Conan series before moving on to works by writers such as Leiber, Moorcock, Eddings, and Lovecraft. Those are still the voices that whisper in the back of my head when I'm reading, or writing, for that matter. MH: You started as a short story writer, but have admitted you wrote a novel early on. Was your short story writing important to your development to long form? And what was wrong with that first novel? SPRUNK: I was first published as a short story writer, but I have always been--in my heart--a novelist. However, its difficult to crack into the novel market. Short stories are good way to pad your resume, if you will, and they're also valuable to hone your technique. Among other things, writing shorts taught me how to: pace for length, write with brevity without sacrificing emotional content, know when a story just isn't working, and (sometimes) how to fix it. As for that first novel, well, the simple answer is that I tried to build a million-dollar mansion with a pair of scissors and some duct tape. I just didn't have the right tools for the job. It took me years to develop those tools. And, by the way, I think I'm still developing. MH: What can you tell me about Shadow's Son to whet our appetites? It definitely seems in the vein of Swords & Sorcery. SPRUNK: I suppose S&S is as good a category as any. My agent describes the book as a fantasy version of the movie Batman Begins. That might be stretching it, but I like to think I keep the reader on his or her toes. The hero, Caim, is a freelance assassin. He's damned good at what he does, but he gets in over his head when he finds himself in the middle of socio-political plot that threatens the heart of the empire. That's the tagline, but really it just means you get a ringside seat to a rousing good brawl. MH: Hmm, Batman Begins... What kind of character is Caim? Sword slinging hero? Cold-hearted killer? Assassin with passion? SPRUNK: The short answer is that Caim is human. He loves, hates, mourns, despises, and cherishes, just like all of us. At the start, he may be slightly dysfunctional. Okay, more than slightly--he's a train wreck of a person. But the events of this novel stretch his perceptions, both of himself and the world around him. Is he a hero? I can't answer that. He is the engine that drives the story. You'll have to tell me if he is heroic. MH: What does Sword & Sorcery mean to you? SPRUNK: S&S means adventure--danger, magic (hence the sorcery), and lots of pointy metal objects (and the swords). The fantasy stories I fell in love with as a child were S&S like Robert E. Howard's Conan and Moorcock's Elric series and, to quote Master Yoda, forever have they dominated my destiny. MH: Where there any real life experiences that helped shape Shadow's Son? SPRUNK: Not really. I mean, I tried to make a living as a freelance assassin, but there aren't many listings for that kind of work in the classifieds. On a more serious note, one of the book's central themes is loss, specifically the loss of a loved one. The passing of my mother when I was a child had a monumental effect on my life. In this book I explore the path of an individual who has suffered that kind of loss and never recovered. 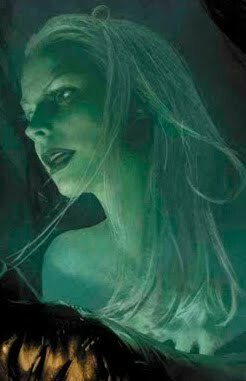 MH: The beautiful cover art by Michael Komarck depicts a ghost-like woman standing behind Caim. What kind of role does she play? SPRUNK: First, I have to take off my hat to Mr. Komarck. I'm extremely honored that this artwork is going to be attached to my humble novel. The ghost-like woman is Kit. She is Caim's best (and maybe only) friend. She also happens to be completely intangible to everyone else but him. SPRUNK: I do make outlines for my novels, but I'm not a slave to them. The story can, and often does, veer away from my finely-laid plans, and I am content to follow new ideas as long as they lead to someplace interesting. When I'm doing it right, it feels like both the logical and the creative sides of my brain are working in tandem. For short stories, the experience is more like flying by the seat of my pants; I grab an idea, and try to ride it to a suitable (and entertaining) conclusion. SPRUNK: I have no idea. I believe that's for the reader to decide. Hopefully, my greatest strength is presenting a story that many people can enjoy. MH: As a debut author you have to tell your obligatory road to getting Shadow's Son published story. And how was your first World Fantasy Con? SPRUNK: Well, I wired a large bribe to the publisher... Actually it happened when I least expected it. I had just read the First Law series by Joe Abercrombie. I was so impressed that I emailed Lou Anders at Pyr Books. Among my praise for his work, I mentioned I had a fantasy novel and would he be interested in seeing it? Long story short, he took a peek, and liked it enough to offer me a contract. At that time I didn't have an agent, so I picked his brain and he suggested JABberwocky. A couple weeks later I had an agent and a contract for three books. It felt like I'd won the lottery, but better because I worked very hard to get to that place. World Fantasy was a wonderful experience. There was an atmosphere of camaraderie among the people there. And it's pretty awesome to just be hanging out at the bar and watch one of your author-idols walk past. MH: In keeping with the name of this blog what’s your type of hat? SPRUNK: I prefer baseball caps for everyday wearing, but my favorite is an old bomber-pilot-type hat that I got from my grandfather. I still wear it outside in the winter when I shovel the driveway. SPRUNK: Two things, huh? Okay, (1) I play a mean guitar on Guitar Hero/Rock Band, and (2) I originally wanted to move to Japan to study martial arts after high school, but my parents talked me into going to college. Since that's where I met my wife, I suppose I have to give them props. MH: Very nice. I'm only decent at Guitar Hero. Forever stuck on medium. Thanks for your time! To learn more you can visit Jon's blog or following him on twitter. Cool interview! Sounds like a cool book too. Lou does know his material, so I shall have to check this one out. Thanks!